I’ve always been passionate about sports and have joined all sorts of competitions, school activities and friendly matches in swimming, rugby, golf, water sports and particularly football. As my career grew into the professional world, I then became very much interested in the business side of it. Fifteen years ago, I had to choose which education and career path to take. The opportunities to start a degree in sports business management were very limited and even more so a football business degree. At that time, the industry was not as developed as it is today and so I decided to pursue another path. I moved to China nine years ago, where I worked in the Event and Marketing industry for different agencies. I’ve experienced all sorts of event projects, brand campaigns and activations. It was an intense journey and working in this country is truly a unique experience. The size and speed of the market is not comparable to any other places and the growth of the sports industry in China is one good example. Through my years of working in Events and Marketing, I’ve been able to see the evolution and trend of the consumer market behavior. In recent years it has been proven that sports is clearly one of the dominant topics. It is definitely following a trend seen in other parts of the world, where sport has grown into a mature industry generating billions of dollars. During my time in China, I had the chance to work on a few sports related projects such as the Manchester City 2012 China Trophy Tour in Beijing, White Collar Boxing event in Beijing, Adidas Boost retail activation and Heineken UEFA Champions League activation. It was always with great passion I worked on these projects. I was also able to experience world-class events such as the HSBC Golf Champions, the ATP Shanghai Master, F1 and other motorsport events, NBA China Global Games, the first-ever NHL games, and most recently UFC. China is thriving with sports excitement and looking at the evolution of the sports market revived my interest to be part of this exciting industry one day. This is when I came across an interesting article on a Swiss newspaper online, talking about a group of young entrepreneurs from my previous university, launching a new master education program in Football Business. While reading the article and learning more from the new founders and the program, it made me realize the importance of the industry and all the potential opportunities that are being created. It was a game changer. Three months later, I was in Manchester starting the 1-year program with The Football Business Academy (The FBA), which would include a three months experience in a professional football environment. This is where it all begins. Although it would completely change my career, I knew I would want to combine my Event and Marketing expertise with the football industry. This is when I met with Benjamin Wahl, General Manager of Borussia Dortmund (BVB) in China. At that time, I was still working full time and studying in the evening. 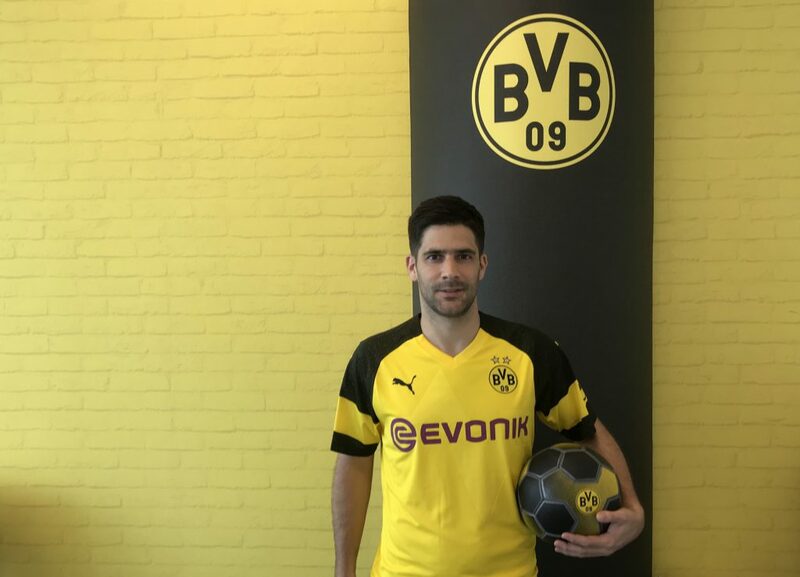 When Benjamin and I came to an agreement to work with BVB for a few months, I took the chance even though I had to sacrifice my financial situation. Benjamin gave me the opportunity to be part of one of the most exciting football clubs in Europe. During the first few weeks, I was directly immersed into the fast-paced world of football. Already filled with years of professional experience, and with the knowledge acquired during the first part of the FBA program, it took me no time to adapt. In only a few weeks, I was given the task to launch the new jersey for the upcoming season, dealing directly with the club’s technical kit partner PUMA, as well as coordinating with their digital communication agency Mailman on key digital campaigns. It was very interesting to work with different stakeholders, involving the partners, also directly involving the headquarters to be in line with club strategies and policies. Everyone was very helpful, and I will always be very thankful for the warm welcome I received into the BVB family. Weeks went by so quickly and every time it would be filled with new experience, new projects and meeting new interesting people. From visiting clubs sharing their thoughts about China, to the visit of legend players participating in some activation with partners, as well as meeting potential partners discussing about the values of the club but also about the challenges in the market. These past 3 months only confirmed what I have always wanted to do: to work in the football industry and deliver unique football experiences to the fans. It has been the most exciting journey and 2018 will always remain special in my life. I have not only married the woman I love, but thanks to The FBA and Borussia Dortmund, I have also started a career I knew I would love. Henri Boppe is a Candidate of The FBA’s Professional Master in Football Business, expected to graduate in August 2018. He can be contacted via LinkedIn. Borussia Dortmund is a German football club based in Dortmund, and one of the most successful ones in the country’s history. For more information visit their website.